WHICH GUITAR WIRELESS SYSTEM SHOULD I CHOOSE? Gone are the days when wireless systems were reserved for professionals playing huge stadium gigs, with cumbersome, bulky belt packs as the price of admission for untethered freedom. In this article, we’re going to discuss some of the main factors to consider when buying a wireless system, and find out how the BOSS WL series stack up to these key metrics. Generally speaking, wireless systems come in rackmount systems (often costly), pedal format (more affordable), and in recent years, bug-style transmitter/receiver combos (most affordable) have become popular. The type of system that you choose will depend on your application – do you just want to minimise extra cargo and be able to plug the two wireless bugs in and play? Or would you rather have the receiver integrated into your pedalboard neatly? Early wireless systems operated on the UHF and VHF radio/TV frequency bands (and many still do). To cut a long story short, over the past few decades many countries have changed their laws around which frequencies can legally be used. This may differ from country to country (meaning that if you go on tour or move countries, your UHF/VHF frequency wireless may not be legal to use), and in some cases even if it is legal to use, it may require the purchase of an annual license. These days, most wireless systems are switching over to the digital realm. The 2.4GHz frequency standard (which is actually a band approximately between 2400 and 2500 MHz, and otherwise known as the band that your WiFi lives on) is free to use worldwide and is now becoming the standard for prosumer guitar wireless systems. Let’s assume that we’re going with a modern digital wireless system. Sure, now you don’t have to worry about licensing or illegal frequencies, BUT in this day and age with so much congestion in the 2.4GHz WiFi frequency range, you want to make sure that your unit has enough channels to operate without experiencing interference from other signals. Some units require you to manually change channels, which means longer setup time if you’re experiencing interference at a particular venue, while others have automatic pairing/sensing functions to quickly set the system on the optimum channel for the environment that it’s in. Also, the more available channels, the more wireless systems of the same kind that you can run all at once. Get the whole band going wireless – the dream is real! Passing your guitar through the wireless transmitter, which then converts it either into a digital or analog frequency signal which can then be sent through to the receiver and converted back into an analog audio signal requires a tiny, but measureable amount of time. This small lag between when you hit a note, and when it actually comes out the wireless receiver into your amp or pedalboard, is called latency. The lower the latency, the better. 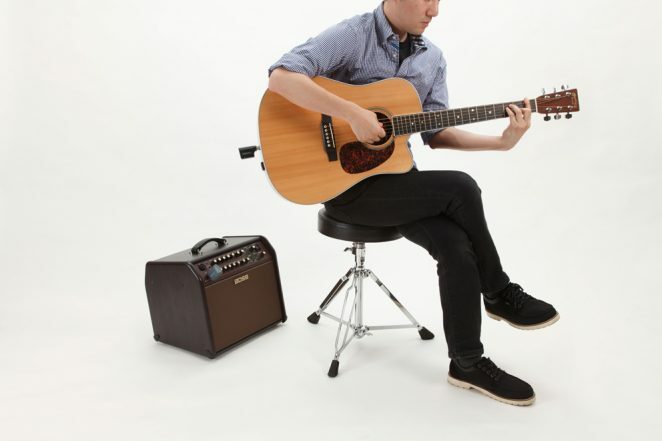 Higher latency may result in a perceivable delay or disconnect between your playing and the guitar sound coming out of your amplifier. Additionally, any other components of your signal chain can add on their own tiny bits of latency to your signal – so you really want your wireless system to be as low latency as possible just to stack the odds in your favour. For context, the speed of sound is 343m/s. If you’re standing 1 metre away from your amp, the sound will take approximately 2.9 milliseconds to reach your ears. Ideally, you’d want something with latency on that order of magnitude or less! Pretty straightforward – the further the nominal range of the wireless system, the further away you should be able to get from the receiver (in theory). In practice, the range will be highly dependent on local factors like solid objects between the transmitter and the receiver (walls, people etc). For normal use on small to medium stages, having a huge range shouldn’t be a major concern. However, if you do expect to occasionally push the limits of the wireless range, then having one with a larger nominal line of sight range should help to a certain extent. It’s important to think about how you’ll be powering your wireless system. Does the transmitter need its batteries replaced before a gig? Is it rechargeable – which means no need to replace batteries, BUT you have to remember to charge it before a gig! And all that aside, how long exactly will the charge last when you’re on stage playing? To be totally safe you might consider a wireless system with a battery life of at least twice as long as your longest gig (assuming you play in a corporate function band doing 4 hour gigs, and you never unplug/turn off your wireless in the breaks – so that’s a minimum of 8 hours we’re aiming for). Tone is extremely subjective, of course. But ultimately, a guitar wireless system should try and transmit your tone as faithfully as possible. And yet – a guitar cable doesn’t do this 100% efficiently either! The longer a guitar cable, the more it loses a subtle amount of high-end in the signal. 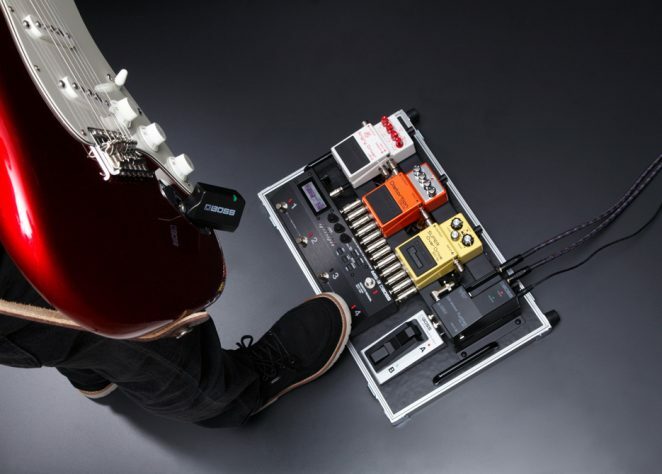 We’re used to hearing this treble roll-off and your guitar tone may seem jarring and a little harsh without it – and for this reason, some wireless systems incorporate a “cable tone” feature which simulates the tone of using real cables. On the other hand, low impedance sources like active pickups, acoustic preamps or keytar/synth do not experience the same treble roll-off with cables, and so for these instruments, the “cable tone” feature may not be desirable or necessary. So, the wireless system that you choose may also be dictated by your choice of instruments. Are you a multi-instrumentalist who may need to switch between acoustic guitar, electric guitar with passive pickups and keytar? Or are you just rocking a bass with active pickups all night? Now that we know all the important criteria for selecting the best wireless system for your needs, let’s see how the BOSS wireless offerings stack up! As a first stop, we’ve included a handy summary table for your reference, using all the key criteria that we discussed just before. For more in-depth reading, head over to https://www.boss.info/global/promos/wireless/!